Normally, you can’t go wrong with giant robots fighting each other. They’re giant robots! So when Respawn Entertainment dropped Titanfall on us in 2014, we were pretty impressed. But there was just a little something missing. Well, if you consider a campaign a little something. How have things changed in Titanfall 2? Standby for… well, you know. 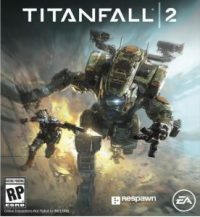 Titanfall 2 follows Jack Cooper (Jack, a total action name) as an aspiring pilot in the war for the Frontier planets. The Frontier is made up of several systems under the control of Interstellar Manufacturing Corporation, who is trying to drive any of the Frontier Militia forces that Cooper is a part of. These groups should be fairly familiar to you from the first Titanfall, but you see some additional context for the war on resources and general galactic power. Cooper gets thrown into being a pilot, which we see is a lot more prestigious and harder to become than you ever would have guessed from the first game. He’s being mentored by respected pilot, Latimosa. Naturally, an unfortunate situation kills Latimosa. But before he died, Latimosa was able to transfer his Titan connection over to Cooper, which brings about BT72-74. BT is yours but is more of a partner than a tool or weapon to be wielding. Cooper and BT will fight through various battles and through various bosses throughout the Frontier system in order to stop the IMS from utilizing the Fold Weapon. The weapon has the ability to control time-displacement and the IMS plans to use it to destroy every Militia-controlled planet. Time-displacement offers some time travel capabilities for the game, which works out in such a cool way for the story and gameplay. Needless to say, adding a fully fleshed out single player campaign significantly improves what was already a fun franchise situation–not to disregard multiplayer-only games. There are definitely a lot out there that are so worth the multiplayer only. But one thing I couldn’t stand about Titanfall was that it presented such a half-measure single player campaign. It all took place on some radios. Titanfall 2 fixes that. In some respects, is it easy to desire a single player campaign so much that you’ll gloss over its flaws? Absolutely; everyone can admit that. Yet while the story does present some typical futuristic war elements (most notably with the time displacement), what works so well in its favor is the characterization of its Titans. 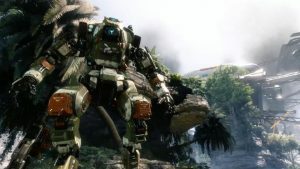 The first game only featured Titans as a tool; Titanfall 2 presents them as a true partner; a brother. BT interacts with you very similar to any other soldier, but because he’s a giant robot, he’s so self-aware of what he can do more than a human. So apologies if I geeked out over BT throwing Cooper across maps to reach locations, not too much unlike the X-Men’s Colossus/Wolverine Fastball Special. For something that could have been oh so cheesy, it worked out oh so well every time. During throws and other situations, BT gives you continual updates about how well your combat syncs together. It’s a nice touch and kind of reminded me of several types of Star Wars droids (especially when BT would mention success probabilities). It was easy enough, while minimal, to interact with BT through a dialogue tree. The connection would have been made better if you were given more insight into the measurement between Cooper and BT. For example, completing an early level resulted in BT letting me know our combat effectiveness rating had gone up a certain percentage because of my success. It wasn’t clear, though, whether I would have improved more based on my gameplay. If I died too much, was I only improved by a few percentage points? Would it have mattered if I never died, or even taken a shot? Because it wasn’t clear, it wasn’t necessarily the most fleshed out portion of the game. The feature does tie into plot devices to help Cooper and BT’s story together. There are some general, very welcomed upgrades to how Titans work this time around as well. Because during the campaign, you almost always need a Titan, you’ll need to recharge and regain health via battery pods around the map. Cooper won’t rely on health packs, though (thankfully). You’ll take on a variety of Titans, either smaller ones or actual bosses. To make another Star Wars comparison, it’s much like facing off against AT-STs and AT-ATs; small and nimble vs large and powerful. 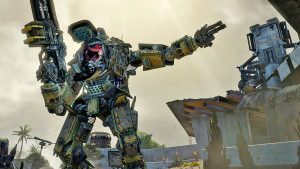 BT will be able to have different Titan loadouts, rather than you needing to rely on different Titans entirely, which will be picked up throughout levels. I found it to be very helpful so I could try to get through levels in different ways, should I run into certain troubles. Multiplayer works in a similar enough way, but the loadouts are locked into different Titan classes rather than available through a single chassis. Multiplayer felt a lot more comfortable than the first game, which I had actually enjoyed quite a bit. The grapple hook that I raved about in my original Comic-Con preview for the game was just as enjoyable as I hoped it would be. There are some other mechanical improvements, such as a slide and a pulse blade, but I still found the hook to be the most helpful. You will have to decide what type of loadout to take into battle, so something like the hook won’t always be available. It kind of marries you into certain styles, but I never felt too hamstrung by that. But what I enjoyed most was the ability to rank through the more fleshed out system regardless of how well your teams (or yourself) are doing. 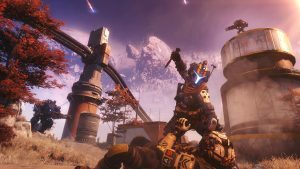 Titanfall 2’s multiplayer doesn’t seem as punishing as most multiplayer games I play, but it never felt overly easy either. In all, it felt smooth and offers a lot more customization options. It wasn’t too much unlike what I’ve seen in most shooters, but it worked. If you were a little turned off from the original Titanfall because of the lack of a campaign, you should feel much more comfortable coming into Titanfall 2. It won’t require you to have played through the first one because mechanically, it’s so easy to jump right into the game. And if you loved the first game’s multiplayer, you should have no problem jumping right back in, but getting some multiplayer breaks through a solid story. The balance between playing multiplayer and single player was actually quite solid. With most games featuring a stark difference, I didn’t get that sense as much with Titanfall 2. 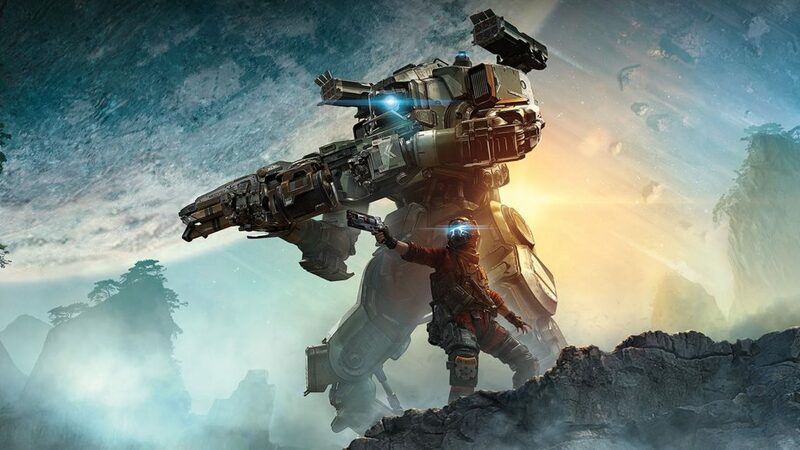 So with a solid campaign, an enjoyable multiplayer system, and giant robots fighting giant robots with legitimately enjoyable parkour, Titanfall 2 is certainly worth your time. A copy of the Xbox One version of the game was purchased by the reviewer.